Thinking Pinoy: FACT CHECK: How exactly did Mar Roxas become "Mar Roxas Ekonomista"? 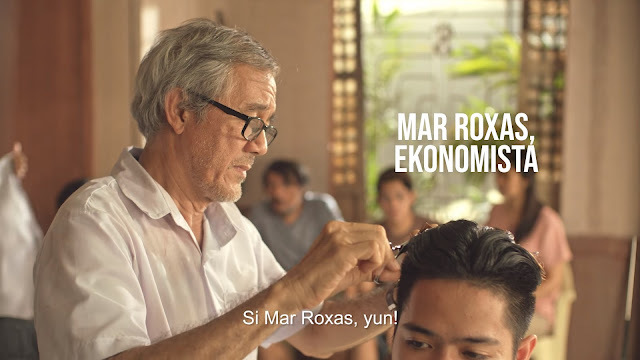 Losing 2016 presidential contender and 2019 senatorial aspirant Manuel "Mar" Roxas II recently launched an advertisement campaign "Mar Roxas Ekonomista", a clear attempt at branding Roxas as an economist... but is he? "Ekonomista! Ekonomista ang kailangan. Si Mar Roxas, 'yun! Maraming ekonomista diyan pero para sa amin, si Mar, aming ekonomista! Maraming bagay na natututunan sa simpleng kuwentuhan. How much of an economist is "Mar Ekonomista"? Born on 13 May 1957, Roxas was just 7 years old in 1964, 17 years old in 1974, and just 22 years old in 1979. In short, Mar counted his "Background in Economics" starting at First Grade. 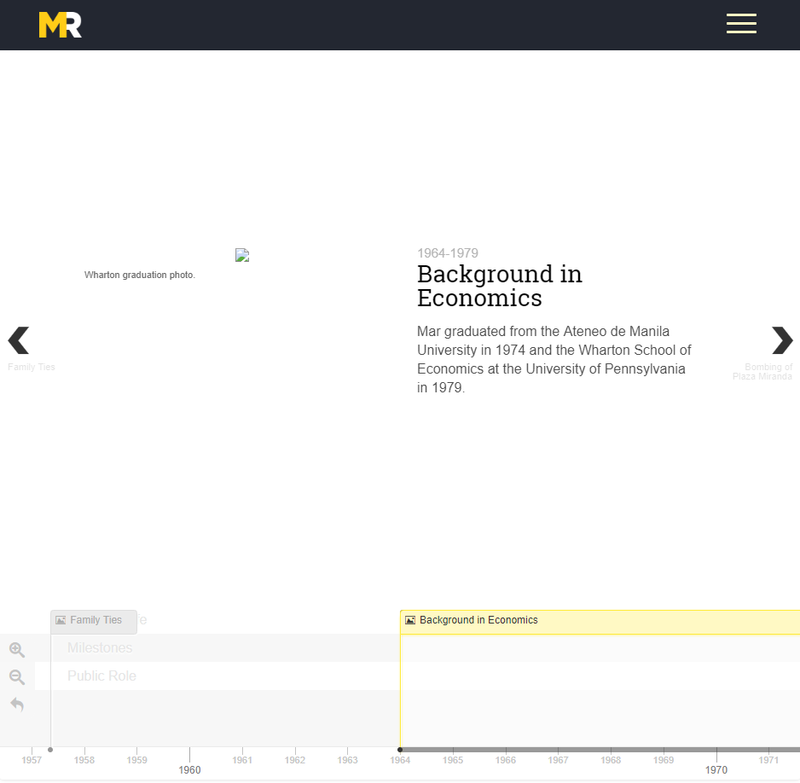 Yes, Mar counted his "Background in Economics" from age 7 to age 22. I don't know about you, but elementary and high school doesn't count as a background in Economics: That's called basic education. This smells too much like resume padding to me. But he has an undergrad economics degree, right? I checked several websites to check the educational requirements for Economists. "A master's degree or Ph.D. is required for most economist jobs." An economist usually needs a master’s degree or Ph.D., but in the case of entry-level jobs, such as in government, a bachelor’s degree is acceptable. "Doctoral Degree usually needed for this career"
Given this, I think it is safe to say that Economists are expected to have at least a master's degree, although entry-level economist jobs may not require it. Unfortunately, Roxas received no postgraduate education at all, so Roxas is an entry-level economist at best. Surely, any self-respecting senatorial candidate will never boast about being an entry-level economist, right? But let's give him the benefit of the doubt. After all, formal education isn't everything, so let's check his employment history for more information. 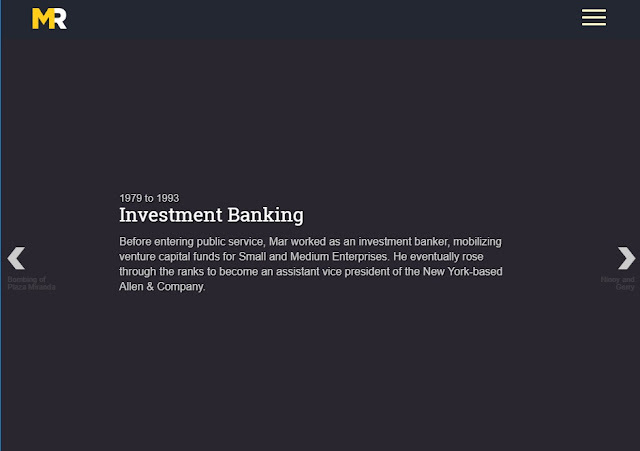 After leaving college and before entering politics, Mar worked as investment banker at Allen & Company on Wall Street, and Mar himself bragged about it in his own website when he said he "rose through the ranks to become an Assistant Vice-president (AVP)”. A screenshot of Roxas's website taken on 20 Jan 2019. Note that Allen & Co. is a boutique investment bank, with “boutique” being a fancy term for “small”. While it can be argued that Allen & Co. of today is a big-time investment bank, we are more concerned about its status when Mar was still working for them. That is, what Allen & Co. was like in the 1980s. Allen & Co. has no research department and has never had a New York Stock Exchange membership. Statistically, the firm is insignificant; Securities Data rankings show, for example, that in mergers and acquisitions, Allen has not ranked higher than 11th among all securities firms in any of the past 15 years. The same article states that Allen and Company's as of 2004 had a total 175 employees, paling in comparison to Barclay's 20,500 employees, or Goldman Sach's 34,000. Moreover, if it had only that many at that time, it must have had a lot fewer in 1980s when Mar was over there. More important, however, is the part where Forbes said Allen & Co. has no research department, implying that Mar Roxas didn't really do significant economic research work during his stint at the firm. And to top it all off, it appears that Roxas' performance as an investment banker wasn't even stellar at all. Let me tell you how exactly. In the world of investment banking, the title of “Assistant Vice-president (AVP) is essentially meaningless. An AVP, also known as an Associate Vice-president, is a classic example of job-title inflation. "...title inflation in the financial services industry is prevalent and the title of vice president is not particularly meaningful." "...[I]n the investment banking and brokerage industries, just about everyone is a vice president, including 'the guys opening the door and serving you coffee.'" Note that the US Court of Appeals and Mar Roxas' own alma mater were belittling the job title "vice-president". Mar Roxas, on the other hand, is an "assistant vice-president", putting him AT LEAST ONE LEVEL BELOW the already meaningless "vice-president". In short, Mar's job title belongs somewhere between "Associate" and "Assistant Vice-president". However, after checking the job portal GlassDoor, it appears that the titles are synonymous because they are listed under the same salary grade. 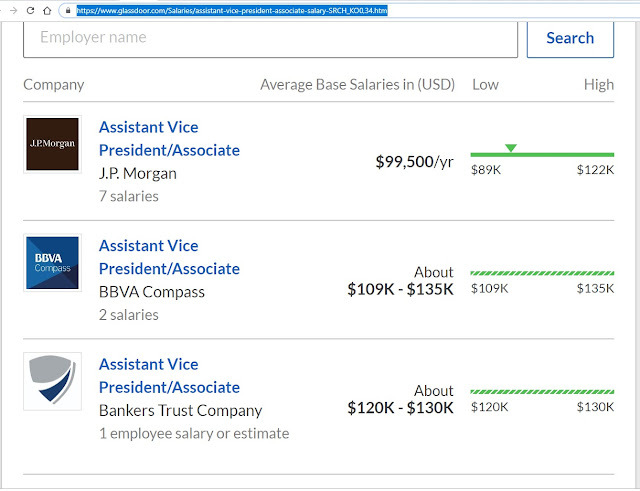 A screenshot of GlassDoor showing that top banks consider the title "AVP" and "Associate" are interchangeable and are both under the same salary bracket. In short, Mar Roxas lasted for FOURTEEN YEARS in Allen & Co. but he got PROMOTED ONLY ONCE. I do not have sky-high standards for senators, but if Mar wants to claim to be an economist, he should be able to demonstrate it. It's bad enough that Mar Roxas has no postgraduate education that's expected in most economist just jobs, but adding the fact that his professional economics background is nothing but a woefully mediocre stint in a small investment bank that doesn't even do research makes it much, much worse. But anyone can argue that formal education and job promotions aren't the end-all and be-all of brilliance, so let's check the projects that he was involved in. Let’s analyze the paragraph more carefully because I am taking these statements with a grain of salt, especially since Mar has a penchant for vague wording. For example, any new hire can “propose” something, any security guard can be “stationed” to another place, and any maintenance crew member can "participate" in a company's operations. But given his predilection for resume-padding as shown in the previous sections, wouldn't it be odd if Roxas willfully declined to brag about the complexity of his roles? Until Mar mentions a specific, concrete, and management-related achievement during his Allen and Company AVP stint, that AVP title will mean nothing. And no, that investment banking stint doesn't make him an economist. But how about during his political career? Well, if one can be economist by being a long-time politician, then pretty much every politician over the age of 50 is an economist. To cut the long story short, Mar is not an economist.